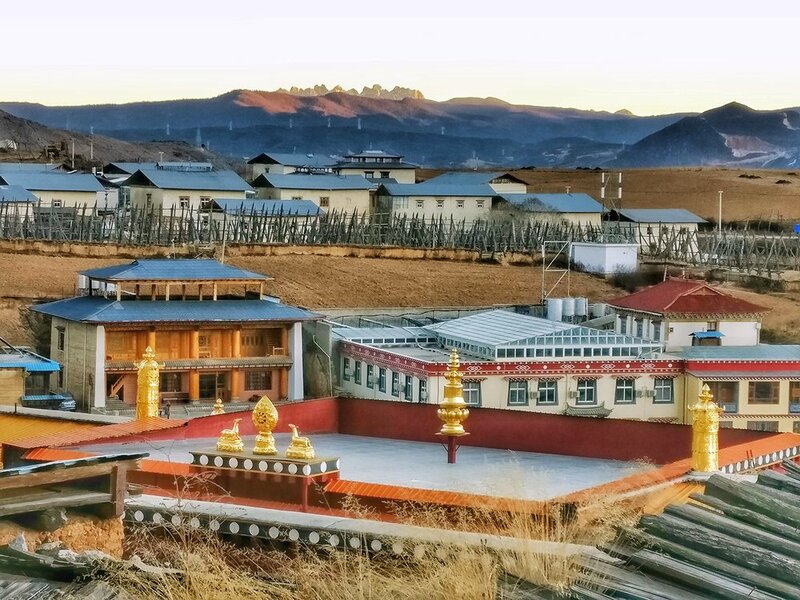 The Ganden Sumtseling Tibetan Monastery in all its glory reflecting the first rays of the sun in the morning. The Lake reflected is glory in its unfrozen part. This is truly Shangrila. One of the largest Tibetan Monasteries it is also called the Little Potala Palace. At an altitude of almost 3400 m it stands at the banks of the Lamuyang Tso in North Western Yunnan in a region which used to be historically a part of the Kham region of Tibet. In January early morning the Lake was semi frozen and I guess the temperature was around minus 10 and the sun was just rising. The bird life of the Lake was just waking up and stir around. The first rays of the sun reflecting off the Gilded domes of the Monastery was indeed a sight to behold. Originally built by the fifth Dalai Lama more than 500 years ago. Destroyed by the Communists in 1959. Rebuilt again in the 1980s. A true marvel of Tibetan Architecture with its enormous size and gilded domes.